The Tubu - Site Jimdo de baroin-catherine! The Tubu are herders whose territory spreads over 25% of the Sahara, to the east of the Tuareg, between Lake Chad and Libya. They subdivide into two related groups which intermarry frequently: the Teda to the north, and the Daza to the south. These groups speak two related dialects of the same nilo-saharan language. 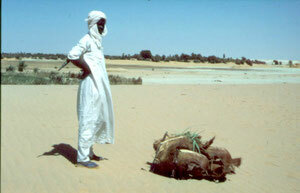 The Teda are mainly Saharan camel herders, and the Daza in the southern Sahel herd both camel and cattle. Both Teda and Daza also often breed small stock on a minor scale. Female camels and cows are favoured in order to maximize milk consumption as well as livestock increase, a key purpose for these pastoralists. Wealth is measured by the size of one's herd, as well as the number of family members. Indeed, solidarity between related nuclear families is inescapable. Most often, it takes the form of animals given for weddings, but mutual aid also takes place when severe problems arise, e.g. livestock theft or murder. The rule of marriage, which prohibits any union with a close relative, multiplies these ties, and a web of loose interpersonal social relationships is thus created. It allows each family to lead an independent life, in a society which has no strong political leadership. BAROIN, C. 2003. Les Toubou du Sahara central, Paris : Editions Vents de sable, 176 p. + 40 photos. BAROIN, C. 1985. Anarchie et cohésion sociale chez les Toubou : les Daza Kécherda (Niger). Cambridge : Cambridge University Press/Paris : Editions de la Maison des sciences de l'homme, collection "Production pastorale et société", 456 p. (ouvrage publié avec le concours du CNRS). BAROIN, C. 2008. "La circulation et les droits sur le bétail, clés de la vie sociale chez les Toubou (Tchad, Niger)", Journal des africanistes 78, 1 et 2, pp. 120-142.